1 Cork Fertility, Department of Reproductive Medicine, Lotamore House, Tivoli, Cork and University College Cork, Department of Obstetrics and Gynaecology, Cork University Maternity Hospital. 2 National Perinatal Epidemiology Centre, University College Cork, Ireland. 3 University College Cork, Department of Obstetrics and Gynaecology, Anu Research Centre, Cork University Maternity Hospital, Cork. 4 Cork Fertility, Department of Reproductive Medicine, Lotamore House, Tivoli, Cork. This was a retrospective review of all oocyte recipient (OR) pregnancies, who subsequently delivered at Cork University Maternity Hospital, between 2007- 2012 inclusive. Obstetric case notes were reviewed to investigate perinatal outcomes and whether OR status had been documented (unambiguously, in code or not at all). Less than one-third (30.2%; n=32/106) had unambiguous documentation, one-third (33%; n=35/106) had no documentation and the remainder (36.8%; n=39/106) had a code familiar only to their obstetrician. There was a high rate of gestational hypertensive disorders (28.3%; n= 30), most frequently occurring with multiple gestation. There was a low rate of clear documentation of OR status. Gestational hypertensive disorders occurred with increased frequency. Oocyte donation (OD), since its introduction 30 years ago, has become an increasingly common solution to involuntary childlessness. Initially, it was used to enable women with premature ovarian failure to conceive1. Increasingly, it is recommended to women of advanced reproductive age and to those with intractably poor embryo quality2. The most recent European data continues to demonstrate a year on year rise in the number of OD cycles. Between 2011 and 2012 there was a 10% rise in the number of OD cycles, and a 28.2% increase on the previous year3,4. The vast majority of Irish couples travel abroad for oocyte donation treatment, most frequently to Spain and the Czech Republic; a tiny minority undergo treatment in Ireland using an altruistic donor. Couples undergoing oocyte donation treatment are counselled to inform their child about his/her donor conception.5 However, in pregnancy, many couples are undecided or do not wish to inform the child and therefore do not wish to disclose their OR status to obstetric care providers. OR pregnancies have a higher incidence of pregnancy complications- particularly hypertension6,7. Non-disclosure of OR status makes it difficult to identify these higher-risk pregnancies, target antenatal care appropriately and may inflate the incidence of complications in OR pregnancies. The objective of this study was to establish the proportion of women who disclose the origin of their pregnancy to their obstetric care provider and the true rate of complications. All OR pregnancies were retrospectively identified from the patient database at Cork Fertility and those that delivered at Cork University Maternity Hospital (8,500 births annually with public and private maternity care delivered in a single unit), during the period January 2007- December 2012, were included. Those who delivered elsewhere were excluded. Oocyte donation treatment with both known and anonymous donors is carried out at Cork Fertility as well as medical support for women who undergo oocyte donation treatment in other clinics. The fertility charts of the study population were reviewed. Obstetric charts were reviewed for documentation of OR status: unambiguous documentation (OR status clearly documented in writing), coded identification (OR status identifiable through a subtle, non-standardised coding system, familiar only to the obstetrician) and no documentation. 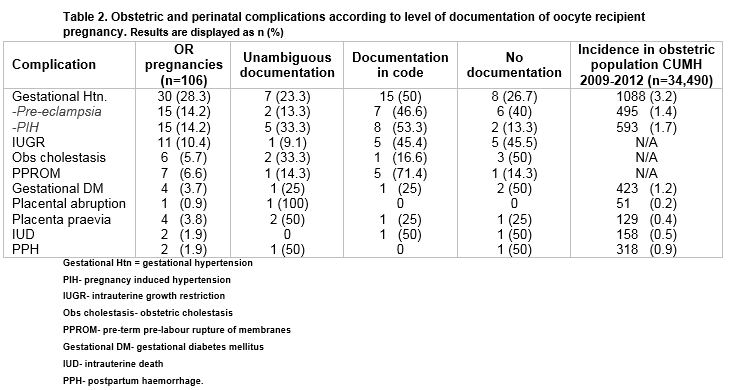 Obstetric medical records were reviewed to identify the rate of maternal complications. Specifically, gestational hypertensive disorders, either pre-eclampsia (defined as persistent blood pressure of ≥ 140/90mmHg after 20 weeks’ gestation with associated proteinuria >300mg/24 hours) or pregnancy-induced hypertension (persistent blood pressure readings ≥ 140/90mmHg, without associated proteinuria, occurring after 20 weeks’ gestation), gestational diabetes mellitus and obstetric cholestasis. The gestation, onset of labour and mode of delivery, were recorded. The rates of maternal complications were assessed according to age ranges: 45 years or older, 40-44 years, 35-39 years and less than 35 years. These were further divided according to parity. The data was also compared to that of the general hospital population8. In this study, we report descriptive statistics on maternal characteristics, clinical practice, maternal and perinatal outcome using SPSS (IBM SPSS Statistics version 20). One hundred and six OR pregnancies (101 women) were identified. Five women had two pregnancies conceived with donated oocytes. Twenty OR pregnancies were excluded as they delivered at other institutions. There were 75 singleton pregnancies, 22 twin pregnancies and 9 triplet pregnancies. There was a high rate of caesarean delivery (77%) compared with that of the general hospital population (28.2% between 2009 - 2012)8. Elective caesarean section (CS) was the most frequent mode of delivery (41.5%; n= 44/106) with only 22.6% (n=24/106) having a vaginal delivery. As expected, multiple pregnancies had a high rate of CS delivery with all triplets delivered by CS (55.6% emergency CS and 44.4% elective CS) and 86.4% of twin pregnancies delivered by CS. However, singletons also had a high caesarean delivery rate of 72% (n= 54/75) with elective CS more frequent (55.5%; n= 30/54). According to the recommendations from National Institute for Health and Care Excellence regarding hypertension in pregnancy, aspirin is advised from 12 weeks’ gestation in the presence of two or more moderate risk factors which include; first pregnancy, age ≥ 40 years old and multiple pregnancy9. Less than one third (31.4% n= 16/51) of the women with two or more of these risk factors were appropriately prescribed aspirin. The rate was highest amongst the multiple pregnancy group (42.8%; n= 12/28) and only 17.4% (n= 4/23) amongst at-risk singleton pregnancies. During the study period, there was one case of severe life-threatening pre-eclampsia. In this case there was no documentation of either donor oocyte or assisted conception. The 35 year old nullipara with diminished ovarian reserve, presented at 18 weeks’ gestation with acute PET. She developed severe HELLP syndrome and an associated liver laceration, requiring laparotomy and hysterotomy to deliver the fetus10. The rate of preterm delivery (<37 weeks’ gestation) amongst singleton pregnancies was 13.3% (n= 10/74; range 28+0- 36+4 weeks’ gestation) and 59.1% (n=13/22; range 33+0-36+6) amongst twins. The gestational age range of triplet deliveries was 28+2- 35+1. All preterm infants were delivered by CS. Of 144 live born infants, one third (33.3%; n=48/144) were admitted to NICU, with multiples accounting for 82% of those admissions (27 infants of triplet pregnancies and 9 infants of twin pregnancies). One quarter of the pregnancies (25.4%, n= 27/106) resulted in neonatal admission to the NICU. All triplets (n=27 infants) were admitted to NICU for reasons of prematurity and low birth weight. Twenty-seven percent (27.3%; n= 6/22 twin pairs; 9/44 infants) of twins had one or both infant requiring NICU admission. Of live born singletons, 16.4% (n= 12/73) were admitted with prematurity (n=4), RDS (n=4) and jaundice (n=4) the most frequent reasons for admission. One intrauterine death, that of a karyotypically normal male infant with absent corpus callosum, occurred amongst the study group. This study highlights a low rate of clear documentation of OR status in 106 oocyte recipient pregnancies, one-third of which were complicated by gestational hypertensive disorders. Gestational Diabetes (GDM) occurred with increased frequency compared with the general hospital population. The strength of this study is that it is the first to report on rates of non- disclosure of oocyte recipient status to the obstetric care provider. It is particularly relevant in those jurisdictions where egg donation is not legally or readily available, requiring prospective oocyte recipients to travel abroad for treatment. The recently enacted Children and Family Relationships Bill in Ireland contains legislation relating to donor conception11. This legislation prohibits the use of anonymous egg donation in the country. However, it is accepted that anonymous egg donation treatment abroad, where, commonly, anonymity is mandatory, will not be prohibited by the Act. This means that large numbers of Irish couples will continue to have anonymous egg donation treatment abroad and many will continue to conceal the status of their pregnancies to their obstetric care providers. We are aware of the limitations of our study particularly the inability to obtain a suitable control group, conceiving with autologous oocytes, matched for age and parity. Data was not available on the general population in terms of age and parity to compare incidence of complications. From this study, we were unable to distinguish if it is request by patients or suggestion by the obstetrician that led to non-disclosure or coded documentation in obstetric records. This important distinction warrants further investigation as it would allow insight into the extent of patient comfort with disclosure and associated concerns regarding confidentiality. 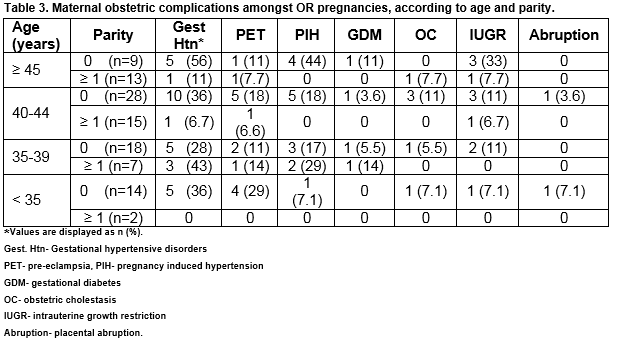 Almost one-third of OR pregnancies were complicated by gestational hypertension and the rates of PIH in particular are similar to those reported in previous studies12-17. Nulliparity and maternal age 45 years or above accounted for the highest proportion of women with PIH. However, nulliparas less than 35 years of age had the highest incidence of pre-eclampsia. Studies by Levron et al and Keegan et al had similar findings, where young oocyte recipients had the higher rate of pregnancy-induced hypertension and pre-eclampsia when compared to IVF patients conceiving with autologous oocytes. They suggest the possibility of a causal link between the pathophysiology of early loss of ovarian function and the development of PIH, which could warrant further investigation18,19. Although our numbers are small, thus limiting interpretation of the data, all cases of GDM in the study group occurred in women aged 35 years or more, which is consistent with the link between advanced maternal age and increased prevalence of GDM 20. There was one case of early-onset, life threatening pre-eclampsia with an associated late miscarriage where there was no documentation of OR status. There are several similar reports in the literature including one by Pecks et al of severe life-threatening pre-eclampsia in OR pregnancies 6,21. The low rate of disclosure and clear documentation limits the obstetric team in the delivery of appropriate antenatal surveillance. Furthermore, opportunities for appropriate intervention, such as the prescribing of aspirin, are missed. The low rates of disclosure and clear documentation of OR pregnancies should be addressed in a sensitive way in order to maintain confidentiality while allowing the obstetric care provider to optimise antenatal surveillance in this higher-risk pregnancy group. 1. Bustillo M, Buster JE, Cohen SW, Thorneycroft IH, Simon JA, Boyers SP, Marshall JR, Seed RW, Louw JA, Seed RG. Nonsurgical ovum transfer as a treatment in infertile women. Preliminary experience. JAMA : the journal of the American Medical Association. 1984;251(9):1171-3. 2. Sauer MV, Paulson RJ, Lobo RA. Reversing the natural decline in human fertility. An extended clinical trial of oocyte donation to women of advanced reproductive age. JAMA : the journal of the American Medical Association. 1992;268(10):1275-9. 3. Kupka MS, D'Hooghe T, Ferraretti AP, de Mouzon J, Erb K, Castilla JA, Calhaz-Jorge C, De Geyter Ch, Goossens V. Assisted reproductive technology in Europe, 2011: results generated from European registers by ESHRE†. Human Reproduction. 2016;31(2):233-48. 4. Calhaz-Jorge C, de Geyter C, Kupka MS, de Mouzon J, Erb K, Mocanu E, Motrenko T, Scaravelli G, Wyns C, Goossens V. Assisted reproductive technology in Europe, 2012: results generated from European registers by ESHRE. Hum Reprod. 2016;31(8):1638-52. 5. Hershberger P, Klock SC, Barnes RB. Disclosure decisions among pregnant women who received donor oocytes: a phenomenological study. Fertility and sterility. 2007;87(2):288-96. 6. Pecks U, Maass N, Neulen J. Oocyte donation: a risk factor for pregnancy-induced hypertension: a meta-analysis and case series. Deutsches Arzteblatt international. 2011;108(3):23-31. 7. RCOG. Scientific Impact Paper No. 8; In Vitro Fertilisation: Perinatal Risks and Early Childhood Outcomes. 2012. 9. NICE. Hypertension in pregnancy: The management of hypertensive disorders during pregnancy. National Institute of Health and Care Excellence Clinical Guideline 107. 2010. 10. Kelly J, Ryan D, O'Brien N, Kirwan W. Second trimester hepatic rupture in a 35 year old nulliparous woman with HELLP syndrome: a case report. World journal of emergency surgery : WJES. 2009;4:23. 11. Children and Family Relationships Act 2015, S. Parts 2 and 3. Dept. Justice and Equality Ireland (2015). 12. Wiggins DA, Main E. Outcomes of pregnancies achieved by donor egg in vitro fertilization--a comparison with standard in vitro fertilization pregnancies. American journal of obstetrics and gynecology. 2005;192(6):2002-6; discussion 6-8. 13. Malchau SS, Loft A, Larsen EC, Aaris Henningsen AK, Rasmussen S, Andersen AN, Pinborg A. Perinatal outcomes in 375 children born after oocyte donation: a Danish national cohort study. Fertility and sterility. 2013. 14. Klatsky PC, Delaney SS, Caughey AB, Tran ND, Schattman GL, Rosenwaks Z. The role of embryonic origin in preeclampsia: a comparison of autologous in vitro fertilization and ovum donor pregnancies. Obstetrics and gynecology. 2010;116(6):1387-92. 15. Stoop D, Baumgarten M, Haentjens P, Polyzos NP, De Vos M, Verheyen G, Camus M, Devroey P. Obstetric outcome in donor oocyte pregnancies: a matched-pair analysis. Reproductive biology and endocrinology : RB&E. 10. England2012. p. 42. 16. Masoudian P, Nasr A, de Nanassy J, Fung-Kee-Fung K, Bainbridge SA, El Demellawy D. Oocyte donation pregnancies and the risk of preeclampsia or gestational hypertension: a systematic review and metaanalysis. Am J Obstet Gynecol. 2016;214(3):328-39. 17. Letur H, Peigne M, Ohl J, Cedrin-Durnerin I, Mathieu-D'Argent E, Scheffler F, Grzegorczyk-Martin V, de Mouzon J. Hypertensive pathologies and egg donation pregnancies: Results of a large comparative cohort study. Fertil Steril. 2016;106(2):284-90. 18. Keegan DA, Krey LC, Chang H-C, Noyes N. Increased risk of pregnancy-induced hypertension in young recipients of donated oocytes. Fertility and sterility. 2007;87(4):776-81. 19. Levron Y, Dviri M, Segol I, Yerushalmi GM, Hourvitz A, Orvieto R, Mazaki-Tovi S, Yinon Y. The 'immunologic theory' of preeclampsia revisited: a lesson from donor oocyte gestations. American journal of obstetrics and gynecology. 2014;211(4):383 e1-5. 20. Fong A, Serra A, Herrero T, Pan D, Ogunyemi D. Pre-gestational versus gestational diabetes: a population based study on clinical and demographic differences. Journal of diabetes and its complications. 2014;28(1):29-34. 21. Schutte JM, Schuitemaker NW, Steegers EA, van Roosmalen J. Maternal death after oocyte donation at high maternal age: case report. Reproductive health. 2008;5:12.